Elizabeth Nunn, a delightful woman who happens to have an odd habit of hanging out in hospitals and abandoned churches, has a grudge. A deep grudge. The kind of grudge that requires professional help to work out, and we're not talking about a psychotherapist. She needs shadowrunners, and if they're willing to take on the job, they'll encounter fierce gangers, wild critters, and members of a secret magical society who fiercely guard their mysteries. If the runners can survive, they can find out just what Nunn is mad about - and how far she is willing to go for her revenge. Boundless Mercy is a series of Shadowrun Missions that were first run at major conventions. Featuring four linked adventures with complete game information, this book offers plenty of resources for gamemasters - and some steep challenges for players. 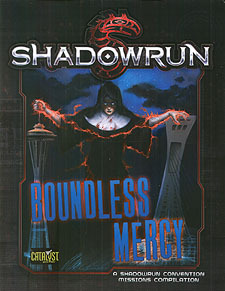 Boundless Mercy is for use with Shadowrun, Fifth Edition.